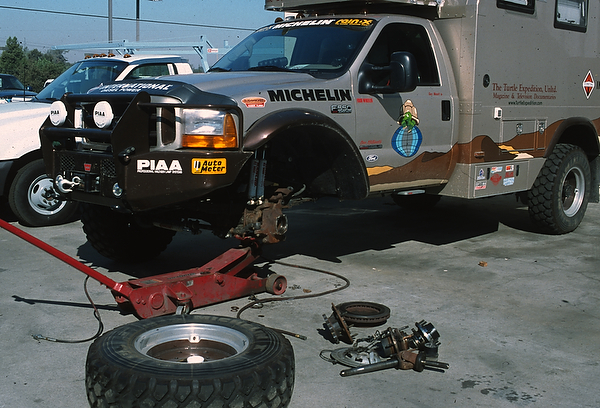 In 1998, when we first saw the Super Duty 4X4 at the SEMA Show in Las Vegas, we knew the F-550 with its 17,500 pound GVWR had huge potential for The Turtle V. As a foundation for the Tortuga Expedition Vehicle, this was the perfect truck, no? It said reliability all over it. However, we were basing our evaluation mostly on our personal experience of driving F-350’s to the tip of South America, all over North America and Mexico, across Siberia, and around the world, without a major mechanical problem. Never mind that The venerable Turtle III and Turtle IV had a no black boxes and a real cable between our foot and the indirect fuel injection pump. 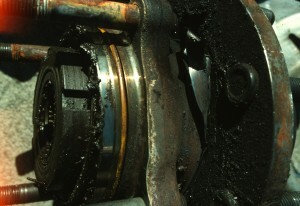 The total destruction resulting from a failed unit-bearing is shocking and expensive. Now, with 70,000 miles on The Turtle V, we have had a failed transfer case, (never explained), a water pump, and recently, a cracked spring retaining plate witch killed the clutch in the middle of Idaho, (still not explained, except that sources at LuK advised us that the original clutch design, not one of theirs, on the 1999 Super Duty 6-speed had engineering flaws, and was later upgraded, without a word to consumers. Enough to say, we have begun to wonder about the long range reliability of some of this new stuff. Readers will also recall the Russian Roulette game we have been playing with the sealed “unit bearing”. (See Summer 2002 PSR) The first time we had one go on The Turtle V, I was doing about 70-mph, passing a horse trailer I didn’t want to follow for the next twenty miles. I had just let off on the throttle when I heard a loud bang, like a blowout; and it felt like a blowout, except the brakes were also pulling badly to one side and smelling. 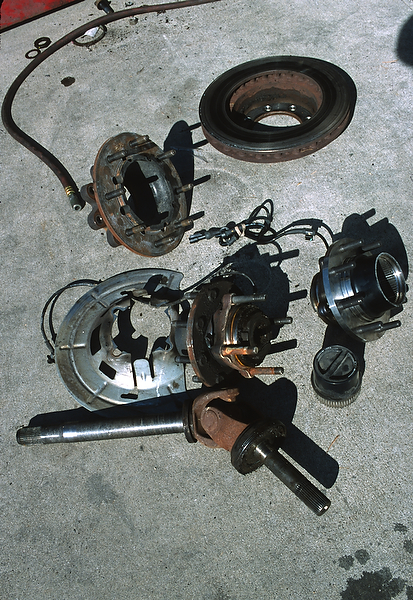 In the next 100 yards, while I slowed down and found a safe spot to pull off, the self-destructing hub took out the rotor, the calipers, the stub axle shaft—basically everything in front of the galvanized brake backing plate was history. When a unit bearing fails it trashes everything to the backing plate: spindle, brake pads, rotor, calipers, .....everything is history and you are stuck on the side of road with no steering. Ford, Timken, and TRW had collaborated on the sealed “unit bearing” for the front hubs, presumably to save time on the assembly line. Unlike older front hub/bearings, they cannot be serviced. Consequently, they have been known to fail without warning. When they fail, the damage can be extensive. The replacement bearing alone runs about $400, plus new studs, nuts, an external O-ring seal, and labor. There is only one warning sign we have noticed that may indicate a bearing is close to failure. If the ABS light comes on and stays on, it may mean the tone ring located between the two sealed wheel bearings is wobbling. If this happens, immediate inspection is advised. 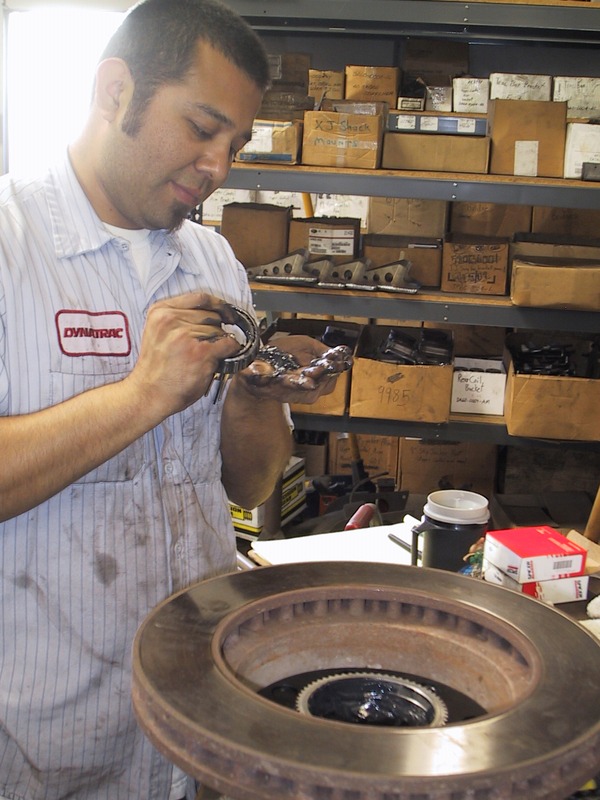 Excessive heat and/or uneven brake pad wear is a second sign of something going wrong. When the plastic bearing cage of the factory unit bearing overheats and melts, the whole hub assembly looks like it has been through a coffee grinder. At the time we were told by TRW and Timken engineers that the “unit bearing” is designed to last 150,000 to 200,000 miles. That’s quite a spread, and with heavy loads and/or bigger tires, those figures can drop significantly. In fact, despite the factories mileage claims, our own research shows that while big tires and heavy duty usage does speed up the process, many people who appear to be using their Super Duties under normal conditions, (stock tires, and light duty use), have experienced failures within the first 50,000 miles of ownership. Officially, Ford deems the unit bearings to be a “normal wear” item, and therefore not covered by warranty at any mileage level. However, some dealers are approving the work under warranty on a case by case basis. One time repairs at Ford dealers can easily exceed $1500. Fortunately, there is now a fix. 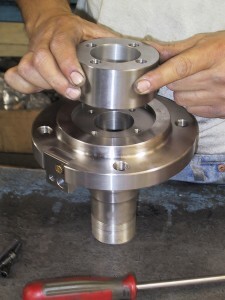 Dynatrac Products Co., Inc. in Huntington Beach, Calif., (www.dynatrac.com), has designed a “fixed spindle” far superior to the OEM “live spindle”. This is basically similar to the hub/bearing assemblies we have known since the early 1980’s. The new spindle is forged from chromolly steel. 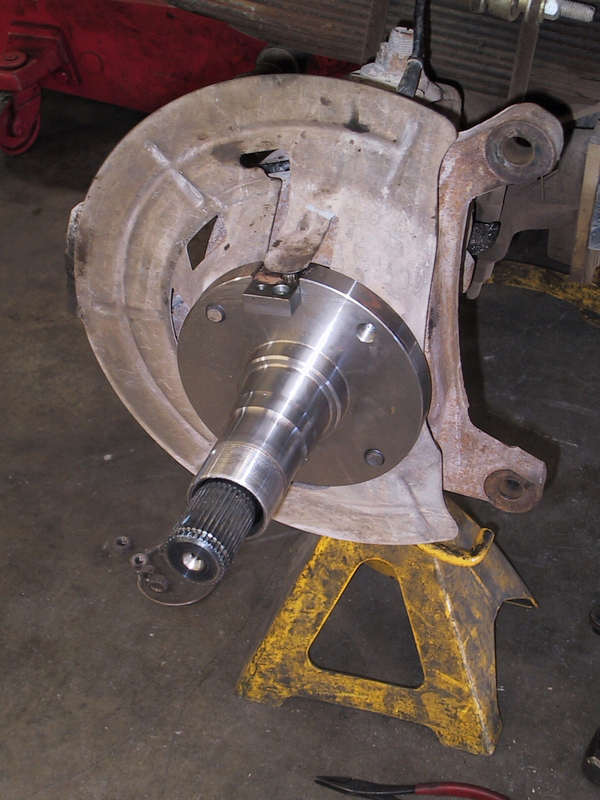 A cast nodular wheel hub replaces the OEM unit. The kit uses Warn Premium 35-spline manual locking hubs to engage or disengage 4X4. 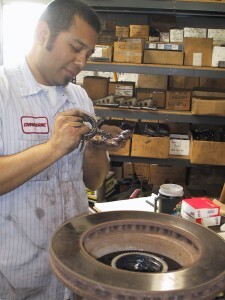 All Dynatrac components are made in the United States to exacting standards the company is known for. 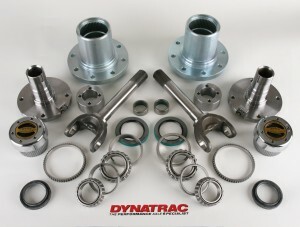 The complete Dynatrac Kit for the Ford 4X4 Super Duty comes complete with all bearings, seals, and replacement spindles, hubs, and stub axles. Dynatrac engineers also upgraded the OEM 1.31 30-spline outer stub axle to a stronger 1.50 35-spline unit. The conversion uses all factory stock components; rotor, caliper, and brake pads; and is fully compatible with the stock ABS sensor. The Timken bearings, races, and seals are the same as those used on 86/97 F-350 4X4 trucks, and are also common to many Dodge and GM 4X4 trucks. They can be purchased at any parts house for about $65, and they can be inspected, repacked, and adjusted as part of normal service. The new spindle is forged from chromolly steel. This is a traditional fixed spindle. The new hub rotates around it. Having experienced bearing failures ourselves, we have been anxiously anticipating the release of the Dynatrac conversion kit. A recent visit to the Dynatrac facilities gave us a close-up look at the installation process. Jim McGean, owner of Dynatrac, explained that the OEM sealed unit bearing had several problems. First, the two bearings are stacked right together, separated only by the thin ABS tone ring. The inner and outer bearings (L) in the OEM hub are stacked right together, which decreases their mechanical ability to absorb the leverage. The Dynatrac design is much stronger, and the bearing cage is steel. This decreases their mechanical ability to absorb the leverage exerted by the wheel, and is compounded by the large dual rear wheel spacer/adapter installed on the front axle, further increasing the leveraged force on the bearings. While the bearing may come from the factory properly greased and torqued, the sealed units cannot be inspected, adjusted, or serviced, so when the seal begins to leak, or any contamination gets in, the bearings can overheat, causing more grease to escape. All this is further aggravated by the fact that the bearing cage in the OEM unit is plastic, not steel. Once extreme temperatures are reached, the cage melts and total failure is rapid and complete. The installation of the Dynatrac conversion kit was straight forward, and could be done at home by anyone who knows the basics of repacking wheel bearings. After setting the break calipers aside, the OEM hubs, brake rotors, and axles were removed. The factory steering knuckle remains in place. All parts were thoroughly cleaned to prevent any contamination. 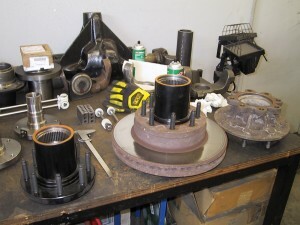 The Dynatrac technician pre-assembled the rotors, dual wheel adapter spacers, and the new hubs on the bench. This makes a rather heavy part to lift and slide over the spindle later. Individual components could be fitted one at a time to the steering knuckle. The dual rear wheel adapters and brake rotors on the front axles of F-550 and F-450 trucks are considerably heavier than those on F-250 and F-350 models. The pre-assembled the rotor, dual wheel adapter spacer, and the new hub makes a rather heavy part to lift and slide over the spindle later. Individual components could be fitted one at a time to the steering knuckle. The cast nodular 35-spline wheel hub (L) bolts to the factory brake rotor (R). The dual wheel adapter/spacer (far left), attaches to the new studs of the hub. Since the OEM stub axle is not reused, we took the opportunity to replace the U-joints on the new 35-spline outer shafts with high quality Spicer joints. 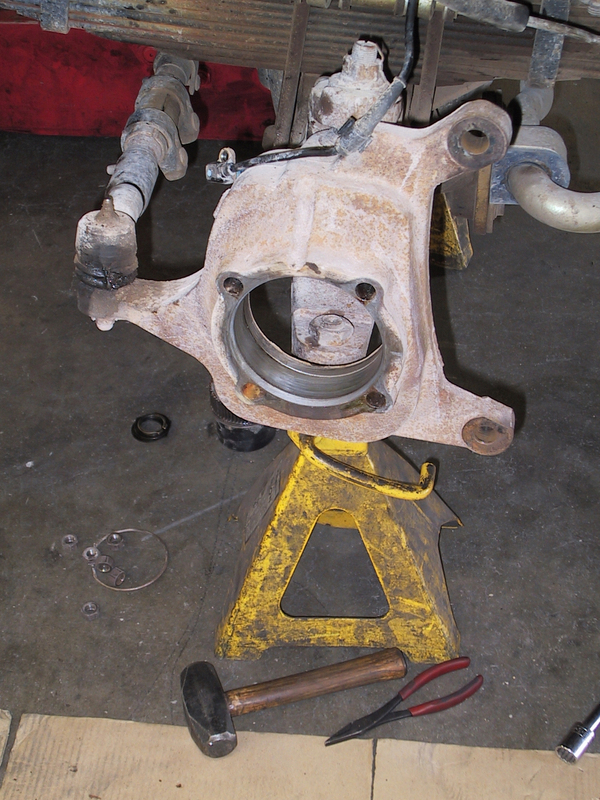 The axles were then slipped back into the axle housing, aligning the splines with the differential gears. 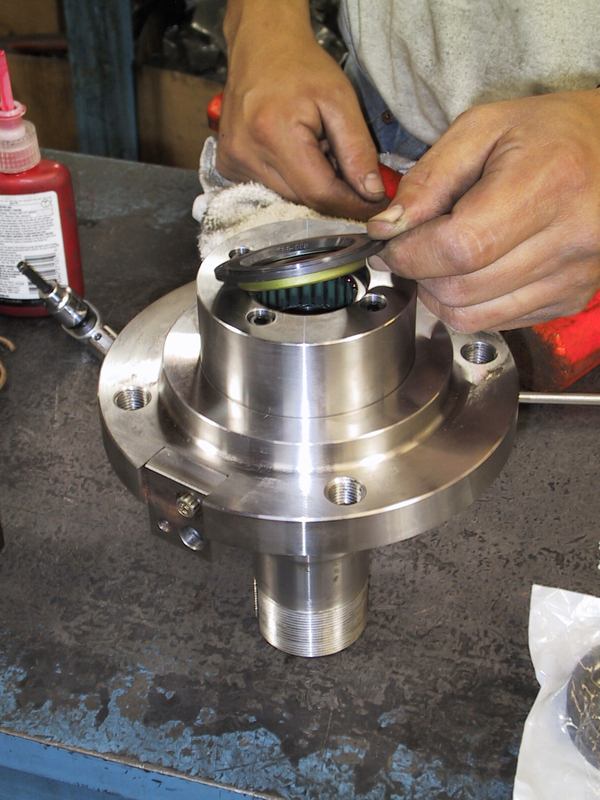 Machined needle bearing housings were mounted on the back of the new spindles, and the larger needle bearings were installed with their seals. After reinstalling the sheet metal dust shields, the spindles were aligned with the holes in the steering knuckles and secured, and the ABS sensors were fitted to the mounting blocks on each spindle. The original steering knuckle and all steering components are retained. When the kit is correctly installed, there is no affect on wheel alignment. 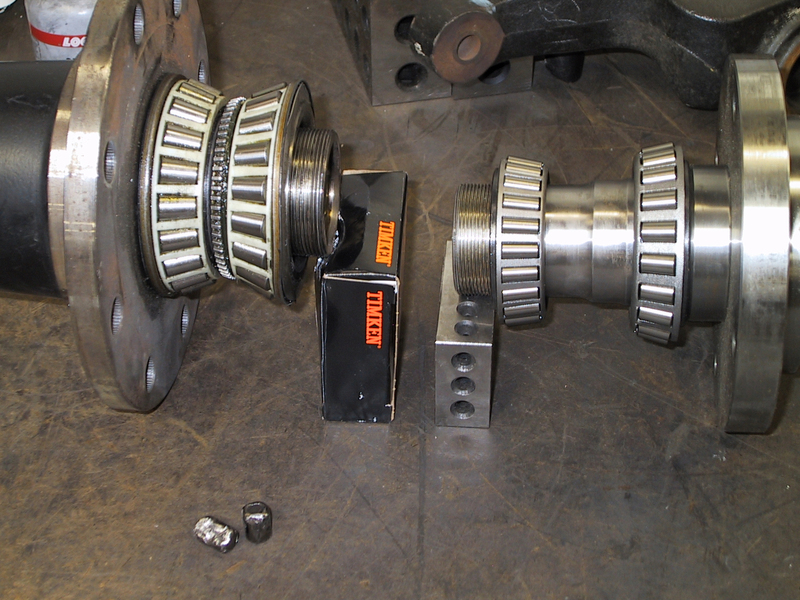 The replacement needle bearings are significantly larger than those in the factory unit hub. A machined needle bearing housing is mounted on the back of the new spindle. With the new bearing races installed in the wheel hubs, the bearings were packed with grease. We did it the old fashioned way; by hand. The instructions note the importance of making sure you have the correct wheel studs, as there are two different types, fine and coarse threads. Dynatrac can supply either one. After the inner bearings are packed and installed, the complete hub/rotor/dual wheel adapter assemblies were slid over the spindles, using care not to damage the inner hub seals. Now the outer bearings could be installed with their spanner nuts and tightened to the correct torque. The new Warn locking hubs slide in easily and are held in place by large internal snap rings. The new Timken bearings were packed with grease the old-fashioned way, by hand. Finally, the stock calipers were reinstalled. 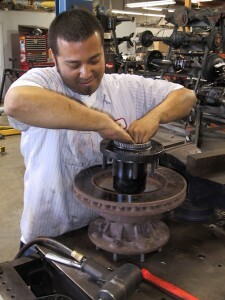 Spacers are provided to assure proper clearance between the pads and the brake rotors. On our F-550, the small tabs on the dust shields that cover the ABS wires needed to be slightly trimmed so they would not rub on anything. When the kit is correctly installed, there is no affect on wheel alignment. 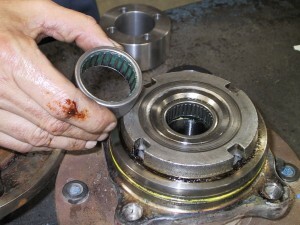 A replaceable seal on the back of the needle bearing housing allows the bearing to be repacked with grease at normal intervals. For Super Duties with big lifts, the original Dynatrac Super Duty Combo Kit is still available. This requires changing steering knuckles and the track bar, and entails considerably more time. The conversion we installed required no welding, drilling, or grinding. The complete kit comes with detailed step-by-step instructions. The only special tools required by a experienced mechanic are a 6 point spanner socket, (OTC #7090-A) or 4 point spanner socket, (OTC #7158), depending on which style spanner nuts your hub needs; a torque wrench that will go to 140 lbs. ; and a race driver like the Snap-On #PPC14LA. 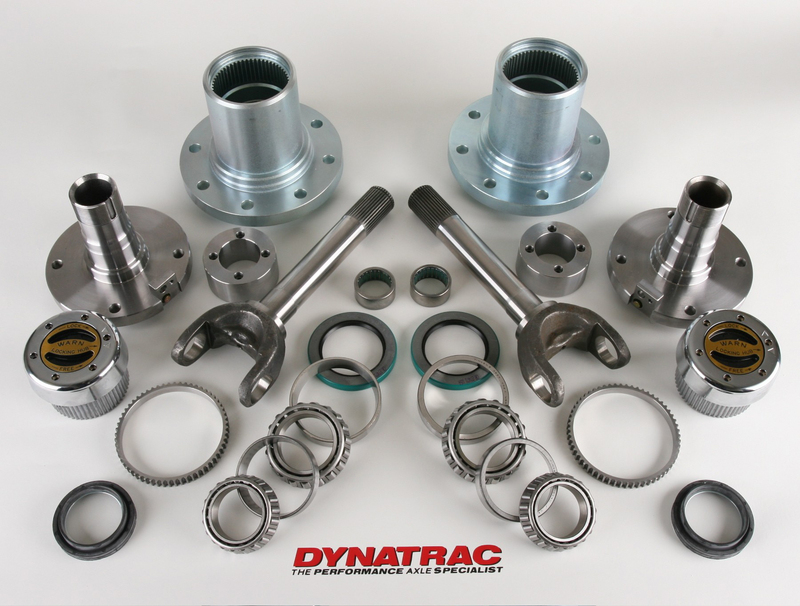 The Dynatrac Conversion Kit fits all Ford Super Duties 4X4 trucks from 1999 to 2011. Kits for Dodges are available from 1994 to 2008. The 2009 and 2010 versions will be available later this year (2012). Cost of the conversion kits start at $1,989.00 and are available directly from Dynatrac or any of their dealers nationwide.